Is it normal for a Dell Inspiron 530 to have is fan to spin up 3 times before it POSTS? I picked up an used Dell 530 desktop. It seems to work, but it has an odd pattern of powering up the case fan (which might be faulty - it sounds like a jet engine) 3 times, while blinking the power light. No other fan seems to activate during the time, and it goes silent after that. I'm wondering, it this is normal behaviour, or is there some issue that's causing it? It might have some BIOS quirks - the words in the BIOS was garbled the first few times, then fixed itself. The system has nothing but a video card (nvidia - I think it's a 8300GS), ram and PSU at the moment. 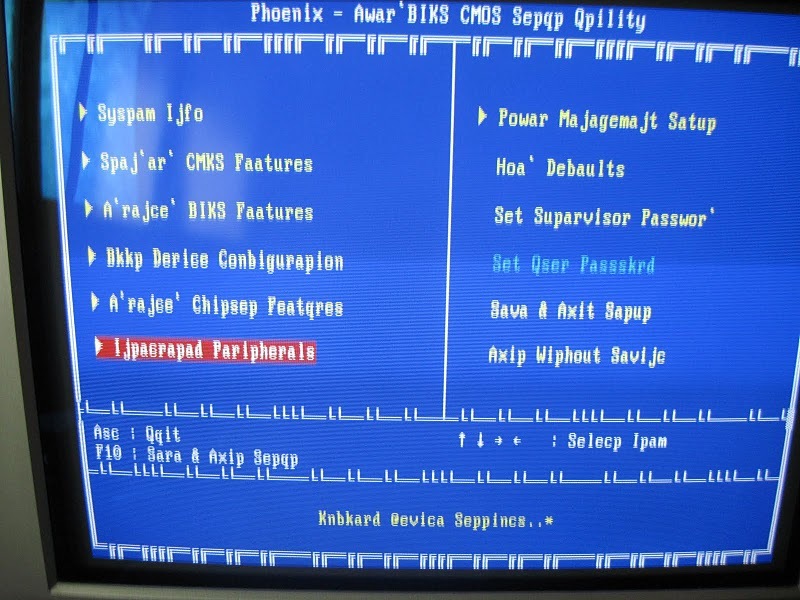 Screenshot of the BIOS (which is no longer an issue) - it was functioning normally other than the language being Swedish chef. This is a secondary issue, and apparently dosen't happen to everyone with the same issue. EDIT(s): memtest is clean, but swedish chefed the same way during one run. Swedish chefing seems random - i got swedish chefed output about 6 minutes into one run of memtest, then normal output during a half hour run of memtest. no obvious capasitor plague - they all look shiny and flat. While there have been answers to the part about the garbled screen, apparently the video card on the inspiron 530 (and the vostro 4000) - a gforce 8300GS is buggy, and the 3x power up attempts is fairly common with this model/configuration. Apparently switching the bios to boot off PCIe rather than PCI means it attempts to power up twice instead then boots normally. Its not behavior common to dells, but with this specific model, its a common bug of unknown origin. The fix would be, presumably to swap the graphics card, but i don't think its worth it in this specific case. EDIT: and.. apparently the system has integrated graphics, and popping out the card fixed the issue. I'd note, if someone can work out why this issue happens, with appropriate backup information, i'll select it as the right answer. Else i'll pick this. Edit 2: And.. we might have a winner. The card's G86 based, and the laptop versions were notorious for overheating issues. It dosen't explain the random nature of the issues, or what exactly, but if someone else has similar problems and wants a why, this could be a useful, albeit sensationalist start. Even more digging yields this - and more interestingly "Random characters on the screen"
EDIT 3: The plot thickens - i installed windows 8, the windows 7 drivers for the card... and presto. it on powers the fans up once, then boots up like a decent system. i'm figuring it did some firmware replacement that fixed it up. It is a corrupt nvidia 8300gs. I had the same problem with my Dell 530s Desktop, took 3 times to start up, then the computer screen would freeze and even turned pink. I thought it was something terminal, then I read on a forum that it was a common issue with the Nividia 8300gs card installed. So I recently bought a Radeon 2400xt card, this card meets the low wattage requirements of your psu, 250w. I installed it and it now starts up first time every time. Problem solved. Many PCs will power fans all the way up during the boot process. You will notice that once the OS loads, the fans spin down. That is the point at which the OS takes over control of the fans through the power management software. Your "Swedish Chef" points to some sort of EEPROM corruption or memory corruption. Try reflashing the BIOS, if that makes it go away, it was just corrupted once. If it keeps corrupting, either find & fix the bad trace (good luck) or recycle the board. Not the answer you're looking for? Browse other questions tagged boot fan or ask your own question. Dell Inspiron 530 strange startup behavior .. why? What explains the garbled message “Start Wandows Ngrmadly” in text mode? I dropped my computer on the floor and now it won't boot. Why is this happening? How to start nvidia driver in console? How do I diagnose overheating? Is it possible to override fan control settings directly through REGEDIT?